Home > Travel > What Is The Holi Festival All About? The Holi Festival. 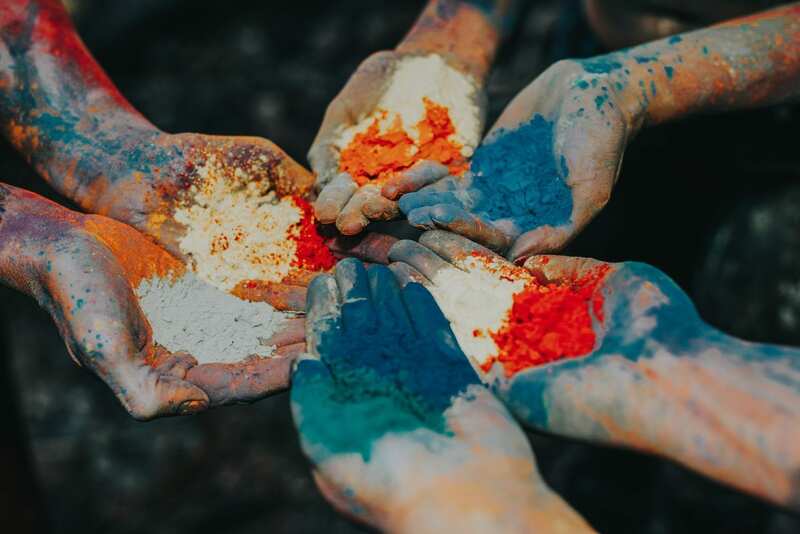 The thought that may come to some people’s minds is that it is simply an event in which crowds of people throw vibrantly coloured paint over each other. It also is known to frequently act as the inspiration for Western music videos (such as Hymn for the Weekend by Coldplay and Bounce by Iggy Azalea). It may seem like an excuse for people to go out into a city, listen to music and have some fun. And yes, that it is a part of the celebrations, but there is a deeper reason behind it. The Hindu ‘Festival of Colours’ symbolises the end of winter in India and marks the beginning of spring. A joyful event that celebrates all that is good in the world and in particular the eradication of Holika (a Hindu demoness), it is a way of showing how Lord Krishna (thought to be Lord Vishnu’s reincarnation) used to interact with others by throwing coloured water and paint over them. The Holi colours are undeniably beautiful. Vibrant and picturesque, many breathtaking images are captured throughout the festival (repeatedly shared all across social media). Each colour is said to reflect a different element. Krishna is represented through blue powder, love and fertility through red, nature through green and yellow the Indian staple of turmeric. An event which dates back to the 4th Century, its origin tells the tale of Holika and Hiranyakashyap (a demon king who was her brother), who wished to be immortal and for everyone to worship him. His son, Prahlada however instead chose to worship Vishnu, which in turn offended his father. Enraged, the demon king asked Holika (who owned a fire-resistant magical shawl) to sit on a fire whilst holding his son. The shawl protected Prahlada and Holika died whilst he survived. The demon king was then killed by Vishnu (who was impressed with his son’s devotion). Whether you are in India or elsewhere in the world celebrating the festival (or even if you are travelling there specifically for it), it will be an event that will make you feel united and free. A riot of colour, it has been adopted across the world by those of all ages. Most commonly held over two days across Nepal and particularly in North India (although some in India celebrate it over two weeks), the Holi Festival always begins in the Phalguna month of the full moon. Beginning with a bonfire, it symbolises the triumph of good over evil (known as Holika Dahan/Chhoti Holi) prayers and rituals are performed throughout the first evening. A magical event no matter you are located, it’s a wonderful way to celebrate all that is good in life and to forget (if just for a little while), the tragedies that life can bring. During the festival, caste, age, race and gender are cast aside in order to rejoice the victory of morality. Although over the years the festival has become commercialised and popular with those of all religions and culture, its main intention is the same – togetherness.